This month marks my 3 year anniversary of becoming a Stay at Home Mom. It’s a position that I never thought I would hold but absolutely love and would not trade for the world. 10 years ago when I married my husband I was fresh out of college, had a good job, plans to move up the ladder, and possibly get my MBA. We happily moved through our life for 5 years without kids. We bought a home, changed jobs, and started a good life for ourselves. When the conversation turned to kids, and I got pregnant in 2010, not much changed. At that point I had a job that was flexible and family friendly. My husband was on the brink of a new job and we were content in our situation. Little Lady was born in January 2011 and I went back to work in April. I was a little relieved to be back in my comfort zone away from the craziness of a newborn. As the weeks passed I missed her more and more and felt this horrible guilt for being away from her. Our house had become a war zone, we never cooked meals, our happy little life was chaotic at best. Memorial Day weekend I remember holding Little Lady and looking at my husband with tears in my eyes saying I need to be home with my baby. So we set a plan into action to see if we could make it work on one income. These are the steps we took that ultimately led to me leaving the traditional workforce in October 2011. It was essential that we planned and went through this process instead of just taking a leap of faith. I realize how fortunate I am to be able to stay home, I know that as much as some mothers (and dads) want to be home, it is just not financially possible. That being said you may surprise yourself, staying at home might be an option if you do a little planning. 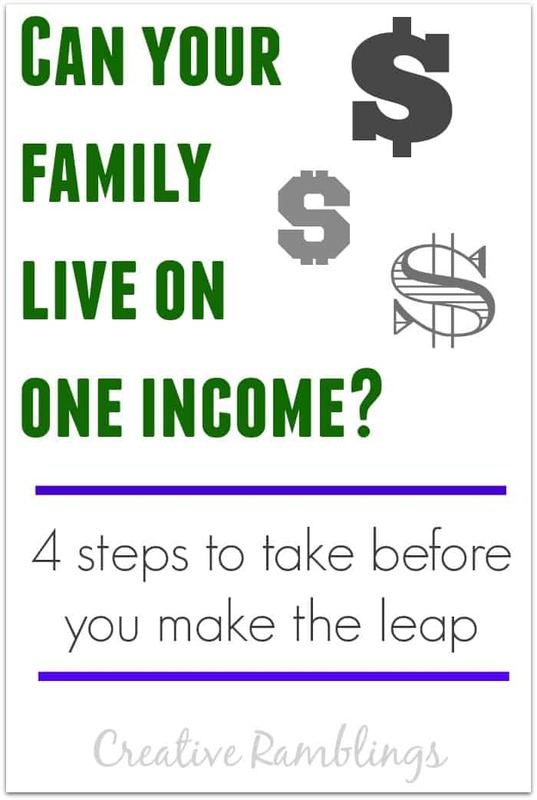 If you are considering moving to one income I highly encourage you to take a look at these steps and go through them before making the leap. When Little Lady was born my priorities and life perspective began to change. I never knew how much a baby would change my life, even though everyone had told me it would. Suddenly that work project, important client, and MBA didn’t seem nearly as important as being there to see my baby roll over for the first time. My husband and I both had this revelation and we discussed it at length. Was the satisfaction and paycheck I got from work more impactful than having a semi organized house and a decent dinner at night? We continually asked ourselves questions like these. Eventually we came to the conclusion that I would be happier at home with Little Lady and our quality of life would greatly increase if I could do more around the house during the day. He would be able to go to work knowing his child was in my care and that after the baby went to bed we could enjoy some not so chaotic time together. This was our process, yours will be different. Every family is different. Have this conversation with your spouse. Don’t talk about money just yet, figure out what you want in life and where your priorities lie first, it makes the rest of the conversation easier. 2 – Are you ready to leave the traditional work force? In January 2011 I was not ready to quit. I was itching to go back to work. I loved my job, my co-workers, the satisfaction of a completed project was something I craved. It was an escape from home, from baby, from this new life that I fell into. By May, I was ready. My husband and I had been talking about our priorities for a while and we both agreed it was time. My husband, the amazing man that he is, never pushed me. He would support me working full-time to this day if he new I needed that to be happy. You will make the best decision if you are honest with yourself and your spouse. My husband and I have talked openly about finances almost daily since we started dating. We make decisions and budgets together. We constantly spit ball ideas on how to save more or stretch our money a little further. When it came to the topic of living on one income we talked A Lot! We looked back at our expenses for the previous couple of months and did the math. Could we do this on one income? What would have to change? Could we pay our bills? Would our lifestyle change? We put numbers on paper, this was not something we could do without data. Our expenses were pretty easy to track, we used credit cards for everything which could be categorized each month. We saw every penny we spent and where we spent it. We took into account not only bills and debt but the very old Buick my husband was driving at the time. What would we do if that needed to be replaced. Get numbers on paper. Again, do not wing this. Be honest with each other and be open to making changes. If you know where your priorities lie you may be willing to cut a few more items out of your life than you previously thought. By the time I put in my notice in August we were confident this was the right decision for our family. These 4 steps, discussed over many months, allowed us to make an educated decision. The only fears I felt after I put in my notice were about how I was going to spend my days, and whether I was cut out to be a stay at home mom…conversations for another day 🙂 I was not worried about paying our bills or feeding our family. Since I’ve been home I have started a small business and this blog. I love being able to contribute to my family again, but still have the luxury of being home with my girls. I want to share more of my thrifty journey through life with you. Typically I share creative DIY projects (that’s part of my thrifty side) but moving forward I will be sharing more of how we live day to day happily below our means. Do you live on one income? I’d love to hear your story. This is such smart and savvy advice. My husband and I took a similar approach. As a critical care nurse in the Midwest, I think many were baffled when I left my job for some guy in the Marine Corps. When I moved to North Carolina, I was working full time again as a critical care nurse; however, once we were married and had our son, we knew that with the demands of the Marine Corps, it would likely be better for our family if I stayed at home. My staff nursing hours were long and demanding as well. As soon as we were married, we opted to live solely on my husband’s income. 10 months of living on one income, and our son was born. I did return to work for a brief 3 months after maternity leave, before leaving altogether. Now we are living in Japan via a military move, and I know a stay-at-home parent is really what my son needs. Your tips are going to help so many parents decide if this decision is right for them as well. Thank you for sharing. Thank you for sharing your story Lauren. It’s so rewarding to look at your child and know you are doing the best you can for them. Enjoy your time with him, how fun for both of you to have this time abroad.